To the liking of historians, a moldering manse owned by Steve Jobs is now officially up for grabs. According to a column in the October 2004 issue of This Old House magazine, Apple CEO, Steve Jobs, intends to give away a 17,000 square-foot Spanish Colonial mansion to anyone who will move it. The house in Woodside, CA, which is not far from Stanford University and Apple's headquarters in Cupertino, was once occupied by Jobs and also played host to former president Bill Clinton when daughter Chelsea attended Stanford. Jobs, however, can't stand the place. He recently sought local authority to demolish the mansion, which he described as "one of the biggest abominations of a house I've ever seen." 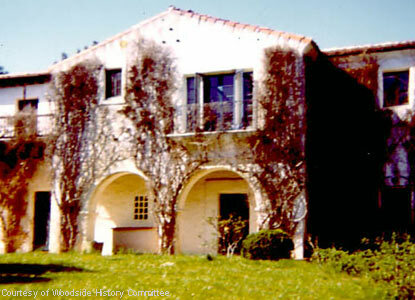 The 1926 Daniel C. Jackling estate was designed by George Washington Smith, the architect who created the look of Montecito and Santa Barbara in the 1920's. Built for Mr. Jackling, a copper magnate who died in 1956, the house sits on six wooded acres that Jobs purchased in 1983 at the age of 29. Preservationists have deemed the house historic, and have pronounced its importance as an example of Spanish Colonial Revival architecture. In March, the house was the center of a public debate, as several people--including former owners and a relative of Mr. Jackling-- spoke about the house's significance and the importance of historic preservation. It appears that Jobs will now offer the house to anyone who is willing to handle its relocation and restoration. Anyone got a pickup truck and a free weekend? Typical eBay scam. "Free house!" But where they always get you is the shipping. Good--there's no going back once history is destroyed. Personally, I'd move MYSELF to another piece of land instead of moving the HOUSE away. But that's just me. this story just makes me laugh...theres plenty of jokes in here but I'm too exhausted and its too late in the day to find them. Jeez, we have no sense of history in this country because we destroy everything old to build new crap in its place. I would like to see what this "abomination" of a house looks like. If we are to believe Steve Jobs the mere sight of it causes children to cry. I think it was Buffy who taught me that nothing over 75 years old existed in the US (except maybe people or other animals). 78 Years must make the age of this mansion a record! If this house is "one of the biggest abominations" Jobs has ever seen then why the hell did he buy it in the first place? And why has he kept it for 21 years? Must be one fantastic piece of land to go through this much trouble. It would be ironic if the heritage restrictions on rewiring this house led to AirPort. Unfortunately I don't have the full text. Synopsis (from memory): Steve bought it for the land, intending to build a much smaller house. Various owners have made all kinds of architecturally questionable modifications, major and minor. It was in bad shape when he bought it and hasn't done much to it. Been trying to get permits for a long time. Preservationists want the public to enjoy it, though it is inaccessible to the public (private land) and hidden from view. Steve has always said he'd be happy to give the house to someone who wants it. If the "preservationsists" want to save the house, then let them buy the darned thing and move it. I really can't see why people think they have a right to tell the rightful property owner what he/she can do with their property. We are not talking about Independance Hall here. I realize I might be the last remaining devotee to the 5th amendment, but I just do not understand the sense of entitlement. If you want to look at the pretty house, then buy the right to do so. By the way, I've seen the house (from the outside at least) and I just don't see what the big deal is all about. Why don't we just preserve the "Spanish Colonial" architecture and not the revival of it? What if we changed the name of "Spanish Colonial Revival" to "Post Modern Spanish Colonial" and consider it just as important as "Spanish Colonial"? Or maybe money buys anything, even the right to destroy history. Maybe wealth is the most important American value. Maybe what remains of our past isn't worth preserving. Maybe... Never mind--some reality TV just came on, I'm outta here! Preservationists are such a touchy lot. Sometimes they want to preserve a house as is. Sometimes they want to rip apart a house and 'restore' it back to its initial 'look'. "You see this whole back section, well, some Civil War general named Lee added that to this house in 1861. So we're going to get rid of it, because we want the house to be like it was when Fred Johnson built it in 1821. Oh, and get rid of that bathroom! There was no indoor plumbing then! Same with the electricity!" And if you look at most of the architecture in the US, most is just knock-offs of architecture from other parts of the globe (its spanish out west, Mediteranean in Florida, etc, etc, etc). Why Steve supports dems, I do not know. I understand the whole social freedom part of it, but Steve is through and through a Libertarian. He owns the propery, and should be able to demolish the damn thing. He should just demolish it anyway, and see what happens. I bet beauracracy won't sort things out until after he dies anyway. The point being, neither you nor I have any claim to have our judgment matter in this affair. Even considering your vast "RESEARCH" into the history of the house, I doubt you can elevate the importance of the house above that of an architectural curiosity. Gee, gang, do you suppose uncle Steve would give it to us? It would make a cool AI clubhouse. That place has 14 bedrooms and 13.5 bathrooms? Yuck. If you want to preserve heritage, I recommend that you stick to places or worship or monuments. If you have a private piece of land that was sold, I don't think you have any say in what is being done with it. Just because the building is 78 years old doesn't mean it is not a rickety old shack. Even the people who want to "move it" have come to the realization that the building has to be "de-constructed" and then "constructed" again because it is in a bad shape. Some think that if all the modifications to the building were removed, the looks would be better. That implies that the design of the original architect is already lost and it is an old building not worth the land it stands on.